“Making Robots Think” is an entertaining peek behind the scenes at engineers of the groundbreaking Robotics Institute, much of whose research is funded by NASA, the National Science Foundation and the Defense Department. The book, however, is more about frustration than achievement. Despite the round-the-clock efforts of the best and the brightest, today’s real-life robots are a dim, lumbering lot, a far cry from the wise, nimble models of science fiction. 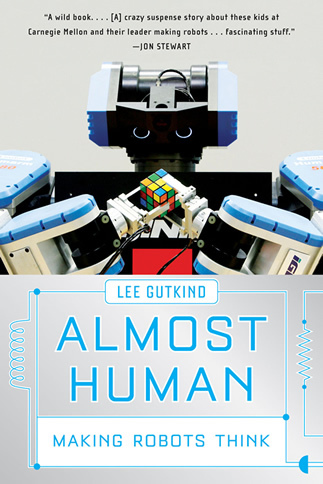 Indeed, the book might well have been titled “Not Very Human” or “Almost Human in the Dark if You Really, Really Want to Believe.” Yet even in the period that Gutkind observed them, the robots did get smarter or, in the case of a robotic soccer team, more agile.